Former Republican presidential candidate Mike Huckabee is keeping any future political plans under wraps. In his first public appearance since dropping a stronger-than-expected bid for the GOP nomination, Huckabee on Thursday said he is "not sitting around" expecting likely Republican nominee John McCain to tap the former Arkansas governor as his running mate. "I'm not one that has any illusions that he has some obligation to me," Huckabee told reporters before an ethics lecture at Columbia College, a small private school in central Missouri. "It's his decision to make. I'm going to support whomever he picks." Huckabee, who won eight presidential primary states before pulling out on March 4, said he plans to "vigorously campaign" for congressional candidates he supports. "I want to do as much as I can to help Republicans and conservatives get elected," he said. 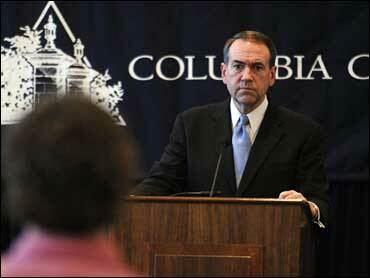 In the meantime, Huckabee returned to a familiar topic during a 45-minute campus lecture on health care and ethics. He described his personal struggles with obesity and poor diet before losing more than 100 pounds, and his subsequent transformation into a marathon runner and advocate for personal responsibility when it comes to good health. "I was a complete victim of my culture," Huckabee said, describing the deep-fried foods he regularly ate growing up in rural Arkansas. Rattling off statistics on the societal costs of obesity, smoking, heart disease and other ailments, Huckabee told an audience of several hundred that "the single greatest economic threat to this country is the health care crisis we face." At the same time, he rejected the notion that a more expansive role by government can help solve that crisis, instead calling for an "incentive-oriented approach." "The government's approach is going to be very expensive, and very intrusive," he said. "Let's pray to God it doesn't end up the government's (responsibility)." Earlier Thursday, Huckabee spoke with students, professors and college employees, offering dietary tips and policy proposals before signing copies of his latest book. He appeared on campus as part of the Althea and John Schiffman Ethics in Society Lecture series, an annual event started in 2003 with a $1.5 million donation from two former trustees. Previous speakers have included Robert Kennedy Jr., historian David McCullough and Arun Ghandi, grandson of Mohandas Ghandi.